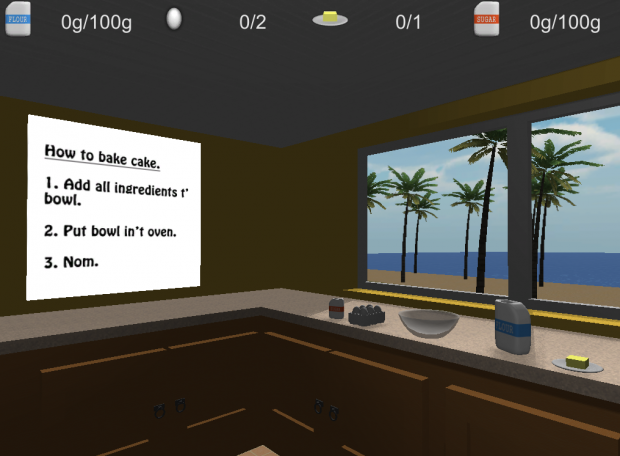 The aim of the game is to bake a cake! Four ingredients are given as well as a bowl. Simply combine the ingredients in the bowl, then place the bowl in the oven. You can control player movement, the left hand and the right hand. As well as each finger/thumb on each hand. Version 0.09 is the initial public release of Baking Simulator: 2014. The build was the final version submitted as part of the Ludumdare competition. - Can combine all ingredients in a bowl. - Can place bowl in oven. More of a proof of concept, but feedback is welcomed. could not find a way to exit out in non windowed mode. had to window key out and close from the task bar. Ah never though of that, as I always test in the webplayer version, where you can't quit. Will fix that in next release, thanks. q and e should move the hands up and down. Finaly it works but the controls are akward.